The tools you carry into a survival situation could make you or break you. 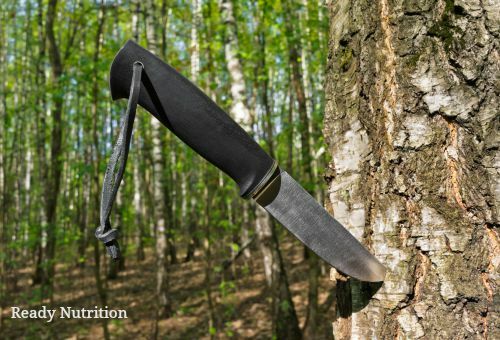 Here is a primer on what you need to know to make the best choice for your survival knife. Before you go out and purchase a survival knife, understand that there are characteristics you must look for before purchasing. As well, keep in mind what uses and environments you plan to use your knife in. Many believe that simplicity is the key – a good blade with a dependable handle is all you need. Inevitably, it all comes down to your preferences, but keep the following points in mind. Although it is a matter of preference, the ideal blade length for a survival knife is between 4-8 inches. This gives the carrier flexibility for smaller tasks and is large enough to perform jobs that require a little more oomph when you need it. The steel used in making knives is also a fundamental characteristic of a good blade. Many of the better-made knives use a combination of alloy (i.e. a mix) of carbon and iron, and other elements such as chromium, molybdenum, nickel, and vanadium to improve the strength and durability of the knife. Here is a chart of the different types of steels for you to turn to. Additionally, you also want to consider is how well the knife will withstand normal wear and tear if it is resistant to corrosion, the blade retention or how well the blade retains its sharpness. A slight bulge at the tip for balance, and to prevent the knife from sliding out of your hand during use. There are four common types of handle materials that each have their own set of pros and cons. Metal – Metal handles made from stainless steel, titanium, and other high-end metals, provide balanced durability and resistance to corrosion. As well, this type of handle is not particularly lightweight and a major drawback is the difficulty in the grip. An alternative is a handle made from aluminum. This metal is lightweight and durable making it a viable choice. Wood – Wood handles are beautiful and very popular amongst collectors. The best woods for this type of handle are hardwoods. Be careful of the types of wood on these handles. Soft or fine woods (like black walnut) can be susceptible to wet conditions. Synthetic Materials – Composite materials like carbon fiber, G10, and ZYTEL® are synthetic materials that make good knife handles. Many of these synthetic materials unbreakable and resists impact and abrasions. This article details the many synthetic materials that can be used for knife handles. Natural Materials – Bone, antler, horn and tusks can make fine knife handles and have been used for centuries. This is a sturdy material for knife handles, and aside from the aesthetics, the drawback is once again is with the grip. As well, I have heard that due to the porous state of natural materials, this can make these natural materials susceptible to deformation and cracking. If you have a knife handle like this, make sure you know that temperature, light, and moisture can impact the longevity of a bone handle. Strictly from a survival knife perspective, composite and metal knife handles are stronger and the most resistant to corrosion. Therefore, these type of handles makes them ideal for survival situations. In a survival situation, many of these materials can be found in the wild. As well, leather makes an excellent material for a knife handle. If you are in a situation where your knife handles breaks, and you have to repair it yourself, a makeshift leather or wood handle is the easiest material to find in the wild. As well, and perhaps this could be considered a fourth characteristic to consider is the skill of the handler. Always keep in mind that knives are sharp tools that can do just as much damage to tissue than to wood or other materials. If you are in a bushcraft environment, you will be away from doctors, so maintain a level of safety when using a knife. As well, learn about the proper knife grasps to maintain the most control of the blade. Moreover, to ensure a long-lasting knife, it occasionally needs to have a little TLC and be sharpened regularly and periodically oiled. To conclude, the tools you carry into a survival situation could make you or break you. You have to trust in the construction of the blade, the materials used, and spend time using it to know what it capable of. A prepper’s knife can see him or her through some dark times and keep them alive. And, basing your survival knife purchase on these characteristics will assist you in investing in the right tool for your survival. This article reminds me of the scene in the dirty dozen when lee marvin is given a bunch of knives and he goes to work trying to break them until one doesnt break. Fairbair Sykes Commando dagger. A knife so good, that when it did rarely break, very rare, the owners would still hone it down and keep it as a short blade knife. What and absolute sweetie of a blade… Yum. Hmm what a fabulous review. A few days ago I lost my favorite knife and I was looking for good one so I was searching on Internet and look what I got ! I guess I got what I was hunting for. I appreciate nice work on review hope get more from real soon.